France Feudal. Souvigny Abbots. Annonymous ca. AD 1080 to 1212. Billon denier. 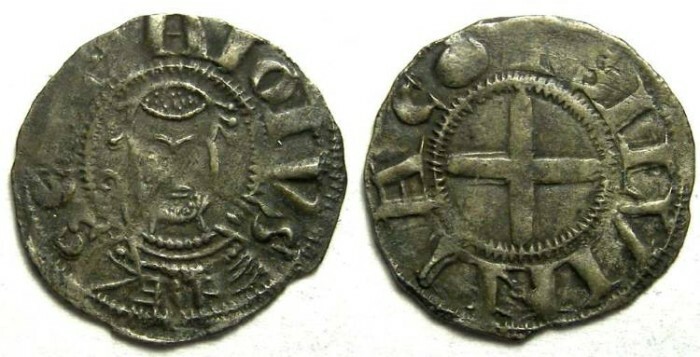 Date : These were issued for a long time, about from AD 1080 to 1213. Size : 18.2 x 19.0 mm. Weight : 1.03 grams. Grade : aVF, very dark toning, with some weakness cause by the ghosting of the reverse cross through to the obverse (most specimens of this type will have this). Obverse : Bust of saint Mayeul facing, with SCS MAIOLVS around. Reverse : Short cross with SILVINIACO around.